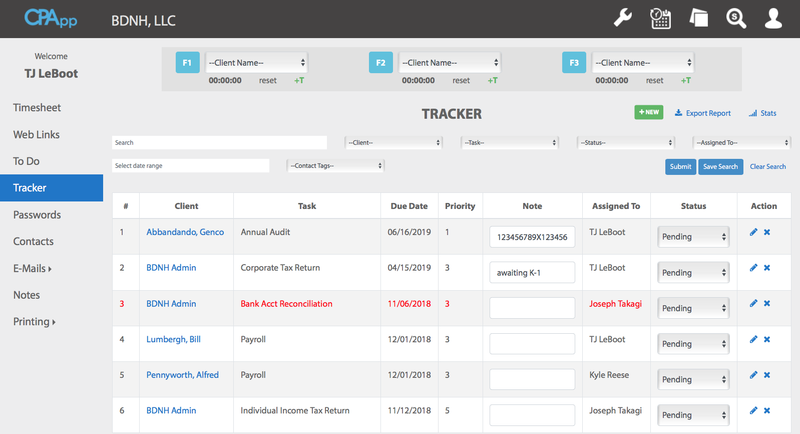 Tracker eases the due date tracking-pain for every accounting and CPA firm. This module keeps track of all client due dates and deliverables. The difference between our Tracker and others is that it can handle tasks that are not tax related and has almost unlimited sorting capabilities. With the same simple and easy to navigate interface as the rest of the software, you can search by name to see what tasks are associated with that client. You can search by due date, task, staff assigned, date range, even status of the project… or any combination of these. Creating a new entry in your Tracker list is easy and designed with a common sense approach. Just like it looks, you enter the client name and how often the task is required. This is super important, because once a task is marked as complete, it clears it from this deadline and opens a new one when it’s due again. All work must be assigned a staff person, so someone is held accountable. CPApp can send an email to someone else, typically a supervisor, when a task is marked as complete as well. 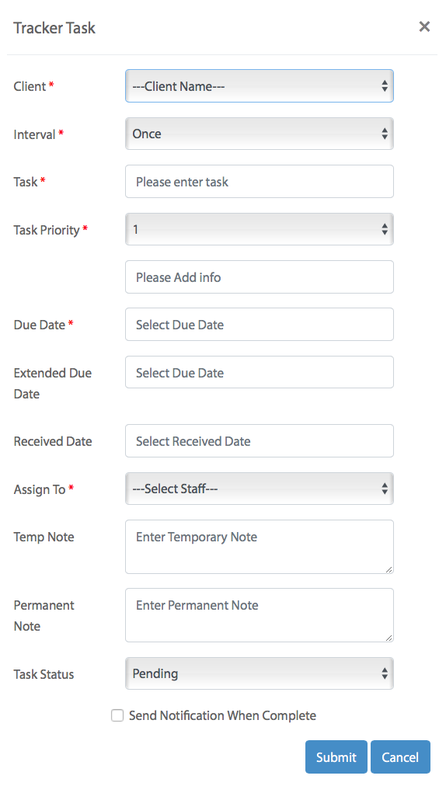 Task Priority is a sorting feature so you can see what is most pressing and what has some time, even within due dates. Once again, and on purpose, everyone has access to edit this module so tasks can be added on the fly, even by junior staff. This is to empower everyone to best track the deliverables they are responsible to complete. The Temporary Note feature is a temporary field that stays with a task until it is marked as complete. I may enter “Awaiting K-1” so we know what’s holding up a tax return with just a glance. Once again, columns can be further sorted by clicking on the headers. Every Monday, everyone automatically gets an email that lists all tasks assigned to them for the next two weeks.